Montana has a greater variety of wildlife than anywhere else in the lower 48 states! And, the variety of landscapes, from wide open meadows to tall peaks around Big Sky make it the best place in the United States to see wildlife in their natural habitat. Here are just some of the animals you can see, and our tips for the best places to catch a glimpse of Big Sky's wildest residents. 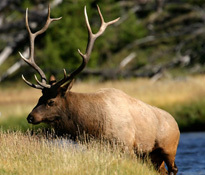 Elk are one of the most magnificent creatures to be seen in the Big Sky area. Herds of these huge animals inhabit the mountain meadows around Big Sky. During the rut, visitors can hear the bugling of bull elk as they communicate with their harems and warn off other bulls. Driving the scenic 15 miles to the boundary of Yellowstone National Park at dawn or dusk is a great way to see a herd. Bighorn sheep are common around Big Sky. Take a hike in the Gallatin National Forest, or simply keep an eye out for them along the roadways as you drive into Big Sky. 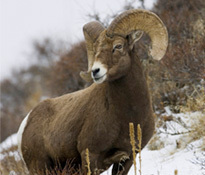 During the late fall, the ramming of bighorn sheep can be heard in the high mountains. The clash of horns as males collide is an impressive sound, and an even more impressive sight. The best time to see this behavior is early in the morning. 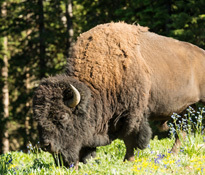 Perhaps Montana's most iconic animal is the North American Bison. Yellowstone National Park is the only place in the United States where bison have continuously lived since prehistoric times. A drive or bike ride through Yellowstone will get you up close to these truly majestic animals. There are a couple of companies that offer customized Park tours, so you can view all of Yellowstone's wildlife from the comfort of a vehicle. For many visitors, the most awe-inspiring sighting is a moose. 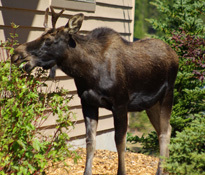 As you drive or walk around Big Sky, keep your eyes peeled for moose munching in marshy areas around riverbeds or on bushes on the outskirts of town. For such enormous creatures, moose can be tricky to spot as they blend into their surroundings. Less than 200 of these stunning animals live in the Yellowstone/Big Sky area, which makes seeing one truly special. Big Sky is known as one of the best fly fishing destinations in the United States and has easy access to the legendary Gallatin River. 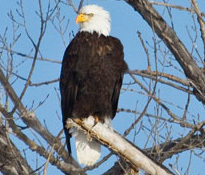 With more than 3,000 fish per mile, not only does the Gallatin attract fishermen from around the world, it also attracts Bald Eagles, Peregrine Falcons and Osprey. You can see these elegant birds sitting in trees scanning the river, and if you're lucky, you'll catch them in action diving to catch a fish. Even the most focused fisherman can't help but be distracted by the sight of one of these stunning hunters. There is so much amazing wildlife to be seen in Western Yellowstone and around Big Sky. Besides the animals mentioned above, bear, whitetail deer, fox, mountain goats and many other species make their home in this area. Spend time outside in Big Sky, and you are sure to see them.